What will be world without trees? It will be a desolate, desert-like environment. Trees provide balm to eyes, green lung to the planet and solace to the soul. Besides they can also act as antennas for spiritual thought and Universal consciousness. Gautam Buddha, Ramakrishna and other saints achieved enlightenment under a tree. It is said that even Newton got his idea of universal gravitation when an apple fell from the tree under which he was sitting. Trees have nurtured life since time immemorial. They are literally a bridge between heaven and earth. They take water and minerals from the roots, carbon dioxide from the atmosphere through their leaves and with the help of solar energy convert them into oxygen and food - the two fundamental ingredients of life. Without trees there would be no life on this planet earth. Besides being food producers, trees also provide other services to mankind. 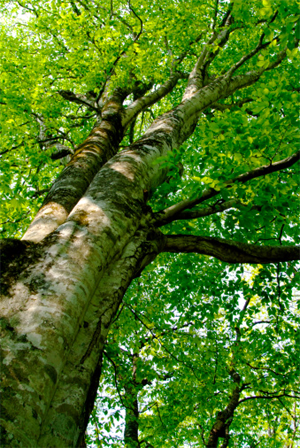 Trees provide housing and shelter to most living animals and also provide shade from scorching sun and rain. Trees are rain producers since the evaporation of water from their leaves changes the microenvironment and helps in rain precipitation. Trees also help clean the air and environment by reducing dust, reducing noise pollution, absorbing pollutants like carbon monoxide, sulphur dioxide, nitrogen dioxide etc. and fighting soil erosion. Trees also release vast clouds of beneficial chemicals. On a large scale, some of these aerosols appear to help regulate the climate; others are anti-bacterial, anti-fungal and anti-viral. Trees are also the planet’s heat shield. They keep the concrete and asphalt of cities and suburbs 10 or more degrees cooler and protect our skin from the sun’s harsh UV rays. Tree cover also reduces tremendously the air conditioning load of buildings. If all the above services were to be provided by man-made machines then it would cost mankind about 4 trillion dollars per year (more than three times the total Indian economy!). Thus trees and forests provide services which are nearly impossible to be provided by any other means . Sleeping under a tree is an extremely pleasant experience and I still remember my childhood when we used to sleep outdoors at night with a huge peepul-tree nearby. One of my earliest memories is of moonlight reflected on its shimmering leaves giving an impression that thousand of small angels are descending from heaven! In Japan, researchers have long studied what they call “forest bathing”. A walk in the woods, they say, reduces the level of stress chemicals in the body and increases natural killer cells in the immune system, which fight tumors and viruses. Studies in inner cities show that anxiety, depression and even crime are lower in a landscaped environment . Trees have also been used as radio antennas by US and other armies. In fact they have found them to outperform other forms of electrical antennas . Human thought which is also a form of electromagnetic wave (though we still do not know what its waveform is) could also be transmitted and received using trees as antennas. Natural systems use all the forces surrounding them. Through million years of evolution nature has developed a mechanism of transmitting low level signals through long distances using the surrounding media as transmitting agent. Thus low level whale songs can be transmitted through thousands of kilometers in ocean. Similarly it is possible that low level signal that we call human thought could be transmitted to long distances with the help of trees as antennas. My personal experience has been that walking under a canopy of trees not only gives a sense of well being and happiness but also acts as spiritual antenna. In 1977 I was doing my Ph.D. in Mechanical Engineering at University of Florida, Gainesville, U.S. One day after lunch I was walking back to the office from my apartment through a thick pine grove when suddenly a thought came out of blue that human thought and gravity are related. This single thought started my journey on spirituality. The idea was so powerful that it caught hold of my mind for next 4-5 months and I could hardly concentrate on anything else. Since this idea came suddenly and so powerfully, I was convinced that it was true – otherwise it would not have come. Obviously I can be charged with delusional thinking (I have not been able to provide a foolproof relationship between thought and gravity) but the idea seemed intuitively true that day and even today after more than 25 years later. I am sure my readings on gravity and attendance of lectures on cosmology at the University must have helped, but the idea came in a flash. This single idea propelled me to start writing on matters of mind/matter interaction and spirituality. Somehow I felt that the pine groves acted as antennas for this thought! . Thus it is in the interest of mankind to populate this planet with trees and forests. Besides nurturing us the trees will also provide a means of communication with beyond. 1. Jim Robbins, “Why trees matter”. New York Times. 2012. 2. Robert Costanza, et. al., “The value of the world’s ecosystem services and natural capital”. NATURE, Vol. 387, 15 May 1997. pp. 253-260. 3. Kurt Ikrath, et. al., “Trees Performing as Radio Antennas”, IEEE Transactions on Antennas and Propagation. January 1975. pp. 137-140. 4. Anil K. Rajvanshi, Nature of Human Thought, (Second Edition). Published by NARI, Phaltan, India, 2010. ISBN 978-81-905781-2-7. US Army used trees as radio antennas! Interesting. Please tell us if it did work?